I tried to download last version of SBT and set path to it in global IDEA properties - the problem persists. I downloaded last intellij IDEA EAP with last version of scala plugin, sbt plugin and another plugins - the problem persists. Can anyone help to solve this issue? The error comes from intellij's sbt plugin https://github.com/JetBrains/intellij-sbt/blob/master/idea-plugin/src/main/scala/org/jetbrains/sbt/language/SbtAnnotator.scala#L41. The return type of (project in file(".")). enablePlugins(JettyPlugin) is Project. It is acceptable by sbt plugin. Not the answer you're looking for? Browse other questions tagged scala intellij-idea sbt or ask your own question. 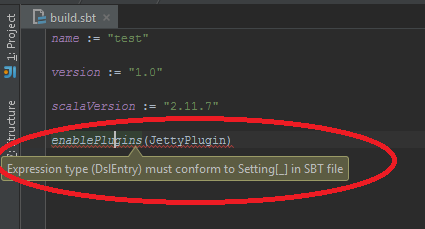 How to change JDK set by SBT import in IntelliJ IDEA?